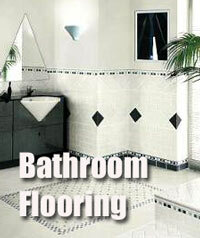 Tiles are obviously a good option for the bathroom as they are resistant to water damage. They can, however, be cold under foot, so it’s worth considering installing under-floor heating for added comfort. Limestone tiles can add another elemental dimension to a modern bathroom. But remember that they will need resealing around every six, so be prepared to invest time to keep them looking pristine. Rubber, linoleum and laminated cork are also good options. Not only are they warm and comfortable underfoot, but they come in strong contemporary design, which can complement modern bathrooms. Mosaic tiling is very popular because it provides a waterproof surface without looking fussy – Fired Earth offers a beautiful selection of colours. For wet areas in minimal rooms, plain white ceramic or stone tiles are also effective. 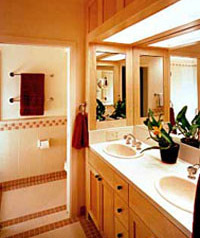 Paint approved for bathroom use can be used to add splashes of colour. Make sure that flooring is practical, safe and resistant to moisture. It is important to remember that some wooden and laminate floors are not recommended for bathrooms because of potential damage by moisture ingress. Solid boards, however are fine if you make sure they are properly sealed.